In young plantations where the Christmas trees are small, weed competition is a problem. Chemical control is an option in the winter months as the trees are hard enough to not be effected by the chemicals. 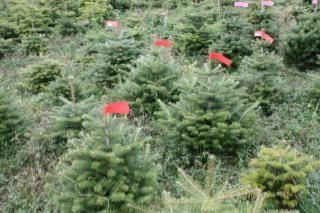 However chemical control is not the best option in the growing season as the Christmas trees have soft new growth which is delicate and would be very susceptable to chemical damage. Furthermore, the plantations become a haven for wildlife during the spring and summer months with insects and birds finding safe haven among the trees. Therefore we tend to mow or strim around the trees to get the weeds down. The problem is, they grow back too quickly, this can be a thankless job. Some growers are happy to leave the weeds as there is also a theory that they offer some protection to the trees. We are trialling this in some areas, but to be honest, the weeds look a mess and we prefer the plantations to be tidy. In this clip Chris is trying out a new mower capable of dealing with this kind of terrain. Not sure if Chris is controlling the mower or the other way round though!! However it is effective as you will see. Enjoy!